I have been an office manager for a Family Medicine practice for 25 years. I am very familiar with CPT and ICD9 coding, billing, and medical terminology. I took the pre-test that comes with the study guide for the CPC exam and passed it, but for some reason still have reservations about taking the exam. Additionally, I am not certain how this will better my career, with the exception of finding remote coding work after retiring from this a few years from now. Does anyone have any suggestions as to which route to go with the certification exams (which credentials are most sought after by remote coding companies)? I wouldn't mind leaving this position a lot sooner than a few years from now, if there was another career possibility in my future. Any advice would be greatly appreciated! My CPC credential has opened more doors for me than my MBA. What about CCS-P vs. CPC? The CCS-P and CPC are certifying you for the same setting. It really depends on the type of coding you envision yourself doing in a few years. Since your experience is on the physician side, it might be wise to exploit that strength--in which case either or both credentials will get you what you want. My advice would be to look at what physician, remote coding recruiters are seeking in their advertisements and go with that. Typically, the preference in physician practices is with CPC. 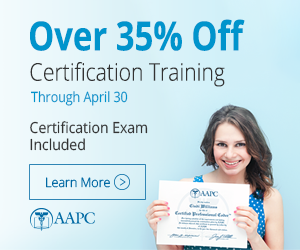 Certified Medical Biller with Certified Professional Coding-Apprentice credentials.